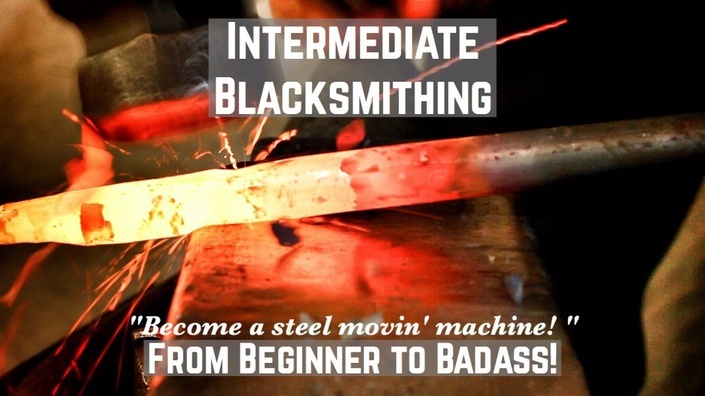 Intermediate Blacksmithing: The Online Course. Step Your Blacksmithing Hobby up a Notch; Go from Beginner to Badass at the Anvil! In this, the second in a series of online courses revolutionising the way we learn blacksmithing: Alec Steele guides you, the beginner smith through an in-depth, technique oriented curriculum designed to give you the proper foundation at the anvil to get creative and begin undertaking your own projects! With over 90 minutes of crisp HD video tutorials and several highly detailed small Ebooks: this online course is made to deliver results! • What tools to acquire to best build up your backyard shop. • How to master the efficient forward taper, bar and reverse taper. • How to punch and drift holes. • How to make a bottle opener. • How to forge non-ferrous metals such as copper, silver and gold to make a ring. • How to forge flat bit, v-bit and scrolling tongs. • How to make a quick and simple tenoning tool. • How to forge the "TV-Tool-Tray". So why wait? If you want to step up your skill level: join now and have access to this tuition forever! Still unsure? Check out this excerpt below to see the level of detail and quality that this course provides. Save dozens of hours of time, sifting through the depths of the internet trying to work out how to progress by following this curriculum, created by someone well aware of the struggles associated with trying to develop a hobby with limited resources! Do it all in your backyard! No need to fly half way around the world to learn from a great teacher, do it all from the comfort of your garden! Pay over 3 months to make it easier on your budget!